Celebrate 365 Blog Party is celebrating the time of year that our Gardens are bursting with produce, as well as the local Farmers Markets by gathering up recipes using all the seasonal produce! It's a wonderful time to be using our garden fresh produce to be creating new and tasty meals with this abundance available to us, come join our party! Whether you love to can/ preserve your produce or just eat your way through your garden, Summer is a great time of year to be enjoying all the wonderful bounty available! From fresh salsa, to salads, grilled corn on the cob, and the ever present problem of what to do with zucchini, finding new recipes is always welcome! Avocado Corn Salsa is a Summer Staple at my house! 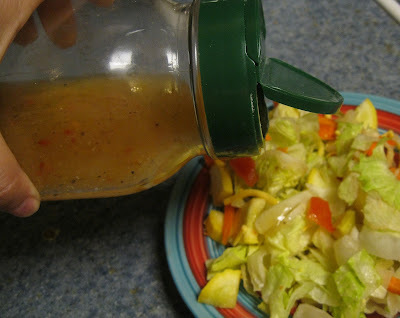 With Summer comes Salads and Making Your own Vinaigrette Dressings is a must! Don't be intimidated! I have a how-to that will teach you completely how to custom make your own with any flavor combination, I talk you through with ingredient choices and how much! So get ready to play with flavors and make some fresh dressings to top on all that fresh produce! Let's get on with the Garden Party!!! Come on and link up your best recipes that use Fresh Produce. Main Dishes, Side Dishes, Salads, Desserts, anything is fair game!